T-Mobile customers are now able to enroll in the iPhone Upgrade program online, a process that used to require a visit to an Apple Store. 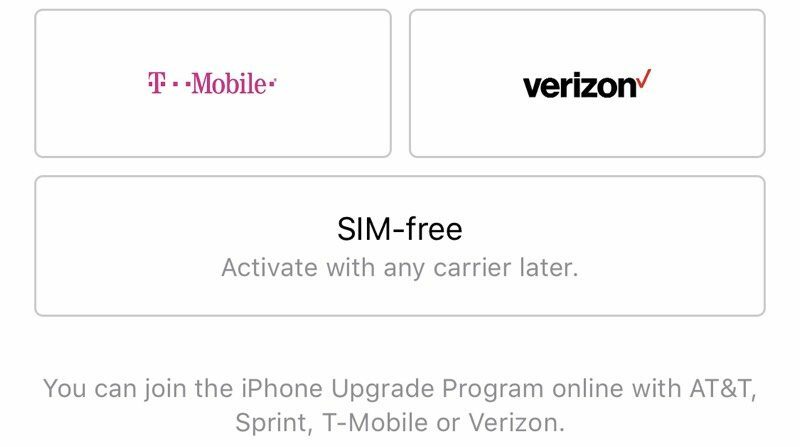 The change is reflected in updated language in the Apple Store app, which now says that customers can join the iPhone Upgrade Program online with AT&T, Sprint, T-Mobile, or Verizon. 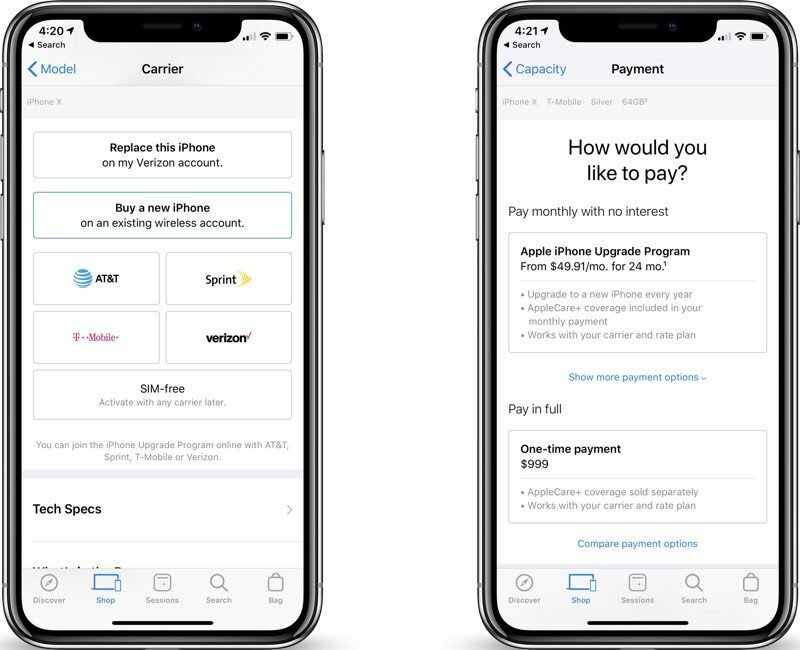 AT&T, Verizon, and Sprint users have been able to enroll in the iPhone Upgrade Program online since the program launched, allowing for online purchases of new iPhones, but T-Mobile subscribers who wanted to upgrade to a new iPhone using the iPhone Upgrade Program could not do so online like other customers for previous iPhone launches. With this policy change, T-Mobile customers who plan to purchase a new iPhone using the iPhone Upgrade Program when the 2018 iPhones launch should be able to do so entirely online without visiting a retail store. Apple last year offered pre-approvals for the iPhone Upgrade Program, which allowed iPhone Upgrade Program customers to get through the checkout process more quickly when pre-orders kicked off. Apple is likely to offer the same pre-approval process this year, which customers of all carriers will be able to participate in. Apple also offered Trade-in kits delivered by mail last year, another option previously not available to T-Mobile users. Can someone explain to me what’s the difference of getting this upgrade program versus paying T-Mobile jump program and paying a down payment and a $30 monthly there after for 24 payments? With T-Mobile, you at least get WiFi Calling. My office is a dead zone for cell signal - an old concrete building with enough reinforcement to block everything. Two of us are on T-Mobile, the other two are on Verizon. I just hop on the WiFi and have plenty of coverage. So a question for you guys. I currently have ATT, but want to switch to T-Mobile when the new phones come out. I have the upgrade program and should be completely done paying for my 7+ in December. What's the best way to jump ship? Go to the store and try and transfer it over to T-Mobile? Just sign up for Tmobile's Jump thing? Perhaps just buy the new phone and sell my old one? With the Apple upgrade program your phone is unlocked so you can switch to T-Mobile whenever you like. Unlike Jump your phone is locked. You can just pay off your phone if you like and sell it and start over again with the Apple upgrade program again. One thing to be on the look out for is T-Mobile sometimes runs all kinds of specials during new phone launches that could benefit you. I switched from ATT to T-Mobile and have not been happier. Best move ever. This is for the current X. You're bound to be over $70 a month for the X Plus. My bill now is less than $100 with the $3x.00 I pay for this Android and my service, together. Ooof!!! Does Apple still force you to get Applecare + I would love to do the upgrade program but have no interest in Applecare. This is a sneaky way of Apple to force people to buy that rip off. Allow me to disagree, it is not a rip off. If you have never used their service then I understand your feelings. Without Apple Care+ when your phone goes south, and you do not have coverage then you must come up with the full monty. Also, there have been times I had a need for calling Apple Care, having the Apple Care+ guaranteed me phone support. Same as with any type of insurance purchase, we hope we never need it, then when needed we are glad we have it. No, it is not a rip off. Looks like we know when pre-orders are going up! Would be smarter for them to do it Saturday morning since the majority of people won’t have to go back to sleep and wake up for work after they preorder. I’ve never used jump or jump on demand and thinking about utilizing for the up coming phone. Can you explain the diff? Pros? Cons? iPhone Upgrade Program isn’t a joke. It’s an easy way to pay for an iPhone and a smart way to get ahead with preorders. I enrolled in the program when I got my 7 Plus in September 2016. When I got the iPhone X November 2017, I did an upgrade through the program. My balance for the 7P was $450. Instead of trading it in I sold it for $600 and used that money to pay off my balance instead of just trading it in to Apple. So I pocketed $150 and still was enrolled in the program. Apple emailed me and said “hey we never got your 7P, so you owe us $450.” So I said, “no problem!” And paid the balance with the $600 I got for selling my iPhone on Craigslist. Apple will trade in your iPhone to basically put money towards the taxes, also remember you get a new iPhone every year, you just have to turn in the old iPhone to get the new one. (The one on the plan) you still have to pay taxes each time you get a new one. Or if you just want to pay the iPhone off and keep it you pay the full two year payments. Heads up Apple runs your credit (soft) on the initial sign up. The credit check that Citizens One ran back in September 2016 still shows on my credit report smh. But at least the second one I did in 2017 didn’t show up on it. Once I’ve made 12 payments on my X, the balance will be $600. My plan is to sell it for $800. I’ll still do an “upgrade” through the program, but won’t be giving my phone back to Apple. Just gonna use the (hopefully) $800 to pay off the $600 balance.